Tickets on sale Fri. 8/25 at 10am! To accompany the announcement, Carpenter has shared the theme from 1994’s “In The Mouth of Madness”. Reminiscing on the original composition he states, "I worked on the soundtrack for In the Mouth of Madness with Jim Lang. We never came up with a great main title theme. In a rented house on Woodrow Wilson (my house was being remodeled), I came up with a heavy metal theme inspired by Metallica’s “Enter Sandman.” My friend Dave Davies played lead guitar, and now, over 20 years later, his son Daniel is playing the lead. One of my favorite themes." 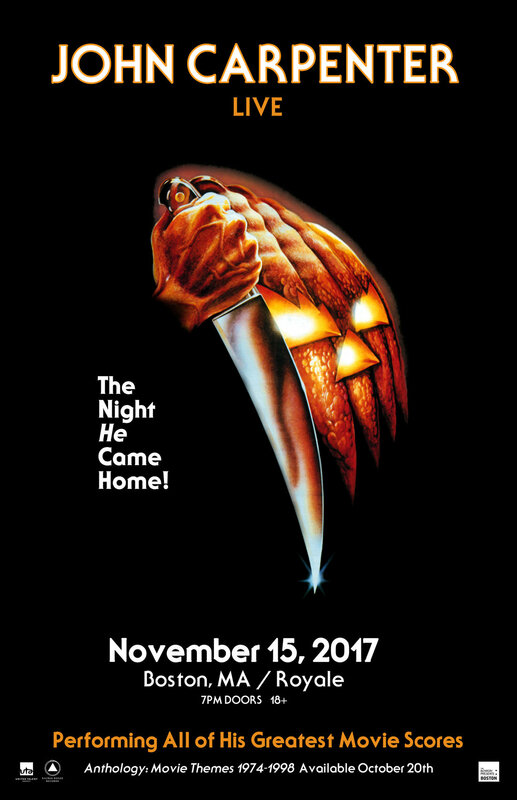 In the weeks following Anthology’s October 20 release, Carpenter will return to the road, playing both classic movie themes and material from his two Lost Themes albums. Tickets for the tour go on sale this Friday at 10:00am local time, including special VIP packages that include meet and greets with John Carpenter and exclusive merchandise (for more details check www.theofficialjohncarpenter.com). The performances will once again affirm the power of the Horror Master’s brilliant work as a composer and musician, and undoubtedly send audiences rushing home to their DVD libraries to dive yet again into the most rewarding filmography in genre cinema.